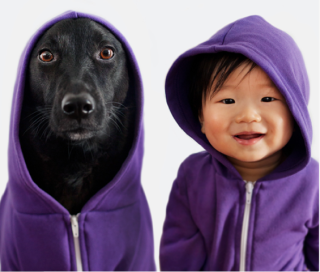 Commercial photographer Grace Chon who specializes in celebrity-and-pet photography just became a celebrity in her own right this week when she released a photo series that featured her son and his best friend. 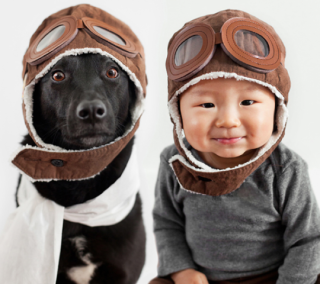 The Tumblr spread titled, "Zoey and Jasper, A Rescue Dog and Her Little Boy" is perhaps the cutest portraits to have hit the digital airwaves in quite some time [well, at Euan & Ellisleast since award-winning photographer Paul Walker snapped that shot of his son Euan with Ellie the Springer Spaniel]. Zoey is a 7 year old rescue mutt from Taiwan. She loves hiking, playing fetch with her toy squirrel, eating crumbs off the floor, and Jasper. 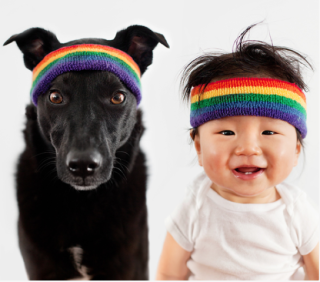 Jasper is a 10 month old Chinese-Korean mutt from Los Angeles. He loves going for walks, eating pancakes and meatballs and yogurt and oatmeal and cereal (sometimes all together), and his best furry friends Zoey and Maeby. As a result of the photos going viral, Kathy Lee and Hoda highlighted a segment on their April 18th Today Show that provided us with the Zoey and Jasper's backstories and how she came up with the idea of featuring the pair in matching outfits. Zoey's a rescue dog originally from Taiwan. She was one of 6 puppies that were rescued before being swept into a gutter. As the runt and the sickliest, Zoey came to Grace Chon's attention where she noted that "a student by the name of Joy rescued the puppies and posted them on a website pleading for help to find them good homes. While she was able to find interested parties in her native land, she had to turn to an animal rescue team to assist with Zoey's relocation to L.A. 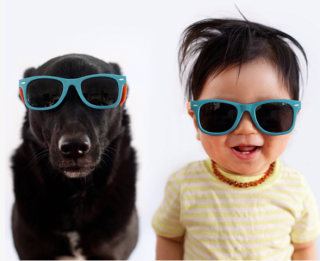 The group assists strays by helping them start new lives in pet-friendly homes. 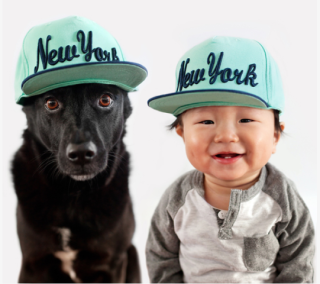 Grace ChonChon, starting the project in January of this year, talks about the project as a labor of love when she realized she had a lot of cute hats and accessories that Jasper could wear but also looked just as great on Zoey. As a commercial photographer specializing in pet photography, her clients over the years have included ad agencies, magazines, publishing companies, celebrities, non-profit organizations and TV shows. When she’s not writing about herself in the third person, Grace likes to go hiking with her dogs, meditate, and grow organic heirloom tomatoes. In her spare time, Grace photographs homeless dogs looking for their forever homes and donates her photography services every year to multiple dog rescue groups in Los Angeles. Try To Get The Beer! The Cinco De Mayo Animal Video Of The Day!!! This One-Eyed Cat Has Mad Skills! The Animal Video Of The Day!!! Cat Friend vs. Dog Friend -- The Animal Video of the Day!! !